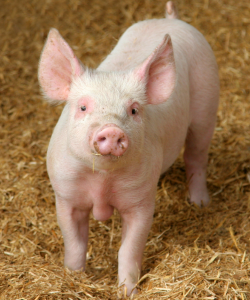 Pork is the culinary name for meat from the domestic pig. 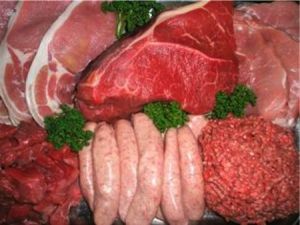 It is one of the most commonly consumed meats worldwide, with evidence of pig husbandry dating back to 5000 BC. Pork is eaten both freshly cooked and preserved. Curing extends the shelf life of the pork products. Hams, smoked pork, gammon, bacon and sausage are examples of preserved pork. Charcuterie is the branch of cooking devoted to prepared meat products, many from pork. Pork is a popular meat in the Western world, and is very common in Chinese cuisine. The religions of Judaism and Islam, as well as several Christian denominations, forbid pork. It remains illegal in several Muslim countries. It is good to use low-fat cooking methods such as roasting, grilling, stir-frying or barbecuing. Choose the leanest cuts of pork and trim away any visible outside fat before cooking. Pork can be eaten and prepared in various forms: cured, smoked, roasted, broiled, grilled, steamed, sautéed, stir fried, braised, fried, and stewed. Pork is naturally low in salt and a rich source of good quality protein. It is also a good source of several vitamins and minerals needed for good health including iron, zinc, some of the B group vitamins, selenium and phosphorus. 1.Lean pork is a great source of protein in your diet. A 100g portion of pork provides you with about half of the protein you need in the day. 1.There are many different cuts of pork with varying fat contents. The leanest of these contain in the region of 6% fat (6g per 100g meat). 2.When trimmed, pork contains more unsaturated fat than saturated fat. 3.There are small amounts of the heart protective n3 fatty acids in meat. In people who do not eat oily fish, the source from meat may be particularly useful. 4.Conjugated linoleic acid (CLA) is another type of fat found in meat. Scientists are interested in its potential health benefits in the areas of cancer and heart health. 1.Pork is a good source of the easily absorbed form of dietary iron. 2.A 100g portion of pork provides you with 15% of your daily requirement of iron. Lean pork is a rich source of B12. A 100g portion of pork provides you with 70% of your daily requirement of the vitamin! 1.A 100g portion of pork provides you with more than 30% of your daily requirement of zinc. 2.Iron, zinc and vitamin D in red meat are more efficiently absorbed than from other foods.